You’ve got your menu decided, your grocery list written out and you even think you’ll have enough chairs for everyone to squeeze in at the table. You’re officially ready to host Thanksgiving this year. There’s just one — or two or three — small problems… how to pull off making the meal of the year when you’ve got little kids to take care of at the same time. Don’t panic, and don’t reach for the pizza delivery menu just yet either. Hosting Thanksgiving while parenting is completely doable. It just takes a little planning and a few extra supplies. Here’s everything you need to survive hosting Thanksgiving when you’ve got little kids. Obvious, right. I know you’re pointing to the adorable turkey-shaped crudités and delicious deviled eggs on your menu right now as if to say, “Got it covered.” But hear me out. Unless you’re blessed with adventurous eaters, most little kids won’t be willing to try your fun, festive appetizers when their stomachs start rumbling. And the last thing you want to do when your hands are covered in turkey giblets is stop to make a PB&J. Since a fed child is a better-behaved one and you don’t want any meltdowns in front of your in-laws, consider making sandwiches the night before so you can pass them out when hunger strikes. And include some familiar, kid-friendly snacks in the mix, like fish-shaped crackers or fruit. Your grandmother’s china is beautiful, which is why the children need to stay far, far away from it. Grab some plastic cutlery, disposable napkins and paper plates while you’re out getting the Thanksgiving groceries so you don’t have to worry every time an elbow goes flying. If the kids are getting their own special table, you can give them the all-important job of setting it themselves, keeping them distracted for another five minutes. At some point, the kids are probably going to want to “help,” which is code for get underfoot while you’re moving hot things and opening the oven. Keep them busy and away from the stove by letting them stir a clean dishtowel in a spare pot with a wooden spoon. If they’re feeling the need to burn off some energy, let them flip over the pot and practice their drumming. Added bonus? The noise will drown out the political argument your husband and brothers are having in the next room. Yes, moms have eyes in the back of their head, but no one can be expected to pull of an amazing meal and watch the kids every single second. Enlist the help of that older cousin who loves to babysit or the fun uncle to make sure no one wanders off so you can focus on reading the directions for the gravy closely. Look: cornstarch, not corn syrup! That was a close one. 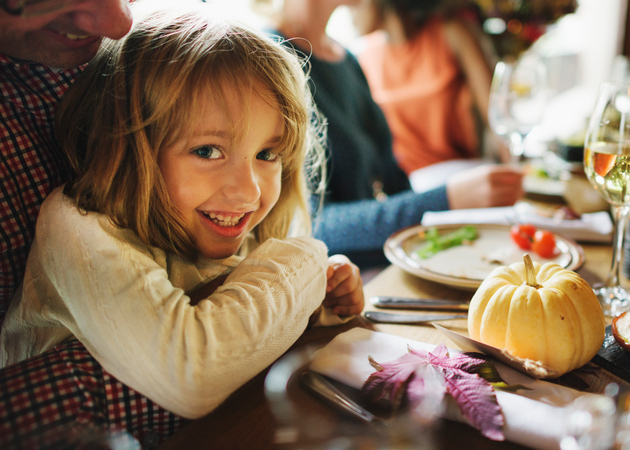 Of course you’ll have games and toys for the kids to play with while the meal is cooking, but consider that they might need something to keep them entertained during Thanksgiving dinner too. Crayons and paper or a quiet activity book for them to play with will help keep them from getting antsy after they’re done eating but the adults are all going back for second helpings. Don’t let Pinterest hypnotize you into creating elaborate table centerpieces. Flickering candles can add a warm glow to your meal, but they’re also dangerous to little hands and bodies. The same goes for anything breakable or small enough to swallow. Stick to plastic or fabric, or go for a nature-lover theme with edible centerpieces made of fruits and nuts. This way, if your kids reach for the middle of the table, you don’t have to pause mid-chew to yell at them. Those special Thanksgiving Day outfits you bought are adorable. Make sure you get some family photos with the grands before you sit down to eat, or consider popping the kids into a backup set of play clothes before the meal so you don’t wind up crying over spilled juice on crushed velvet. Speaking of meal mishaps, when little kids are around cranberry sauce, there’s bound to be at least one accident. Having cleanup supplies on hand makes it more likely that you’ll be able to use this tablecloth again next year. Because no matter how delicious the Thanksgiving meal is, there’s always one child who refuses to eat it. The day will be a blur of measuring, mixing and telling your younger daughter to stop chasing her brother around the dining room table. But it is, after all, a special occasion. Keep your phone on hand or pass it along to a family member who’s handy with a camera to capture those fleeting moments that make the holidays special. You successfully pulled off a feast for the family and managed to keep the kids alive at the same time. Cheers to that!